Take a look at the pergola definitions below to help you decide. When designing my first garden, I was confused about the difference between a pergola, a pagoda and gazebo, mainly because pergola and pagoda sound very similar, and a pergola and gazebo seemed to be one and the same thing! The distinction between the three tends to be blurred, each borrowing style elements from the others. 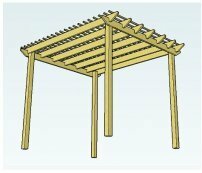 Here are some pergola definitions and pictures to help you. Where a syllable of a word is marked in bold type, that is the syllable where the emphasis lies. 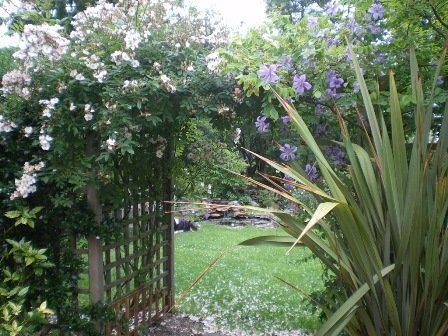 - arch of trelliswork with climbing plants trained over it. - a framework that supports climbing plants. This is a pergola in Valencia. It clearly shows the supports and rafters found on a pergola. The rafters are flat and run, at intervals, down the length of the pergola structure. The supports have climbing plants growing up them. 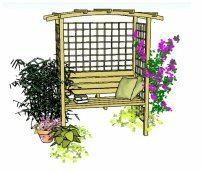 For a garden pergola, you may have trellising at the sides, as an added support for plants. Pergolas can be constucted out of a wide range of materials including wood, wrought iron, vinyl or brick pillared. So there are your pergola definitions - now lets take a look at the others. - a religious building of the Far East, especially a multistory Buddist tower, erected as a memorial or shrine. - a structure such as a garden pavillion built in imitation of a Buddist tower or Hindu temple in India, China, etc..
- a freestanding, roofed, usually open-sided structure providing a shady resting place. - a turret or summer-house with a wide view. This gazebo can be found in the Terrazza Mascagni in Livorno, Italy. It shows the covered roof structure typical of the gazebo style. The roof of a gazebo doesn't have to be completely covered, although it usually has a domed or turreted style. This is where it differs from the pergola, which tends to have flat rafters, unless of course it is an Asian style pergola, which may have turret shaped rafters, reflecting a pagoda style. 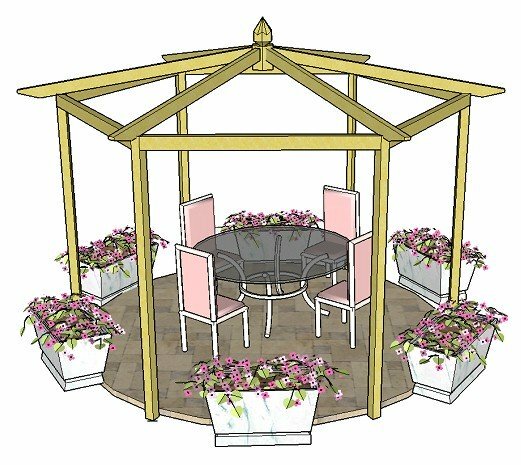 The shape here is circular but a gazebo can be any shape, including square, rectangular or multi-sided. Fabric gazebos borrow the turreted style of the pagoda - in fact, try to picture a marquee without the side panels. Fabric gazebos became very popular recently, for dining 'al fresco' (outside - 'in the fresh air'). Gazebos, like pergolas can be made from a variety of materials. So, to summarise - these three types of structure are closely related in terms of style or construction but they do actually have something that is particularly distinctive. I hope these pergola definitions - and of course those for the pagoda and gazebo - clear up any confusion you may have had. Like any thing else, it all becomes clear when you know what you are looking for!